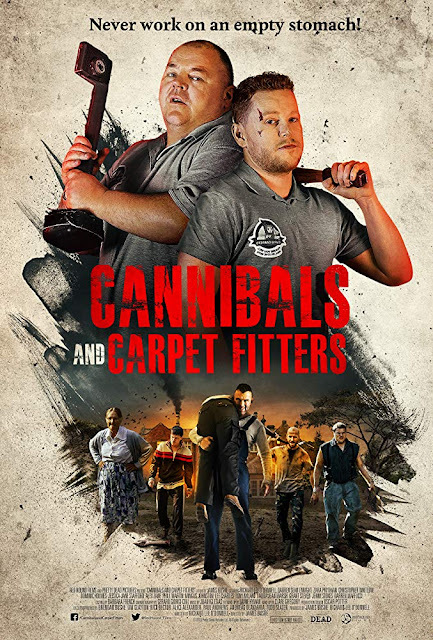 Cannibals and Carpet Fitters is a British horror comedy that features a nice blend of the two styles. There is humour a plenty to be found here, yet there are also moments of legitimate horror. It reminded me of the style of something like Doghouse in this respect, even going as far as to end on a similar note. A group of carpet fitters latest job is at an old country house in the middle of nowhere. However their hiring is all a pretence to get more victims for the family of inbred cannibals who live there. With the violent family quickly working their way through the fitters it is up to the final few to find a way to defeat them and escape the property. As the synopsis would suggest there isn't anything original here on paper. However I found this to be very entertaining due to the quality with which it was made. This is well directed, and well paced with not a single moment that felt like it didn't need to be there. Often when people find themselves under attack by a group in a film there are moments that just feel like padding to increase the length. Surprisingly though despite this being a remake of a short 18 minute horror of the same name (also directed by James Bushe) the increased length just leads to more content as opposed to feeling stretched out. The story might be a weakness of this but there were a fair few moments that took me by surprise, such as initially being unsure who the primary protagonists were going to be. From the very start I found the special effects to be fantastic. This is something which carries on throughout the movie with each of the many deaths looking great. This adds so much to the enjoyment I had here, especially with how sudden many of these deaths occur, and how gruesome they are. Someone getting their nose sliced off with a machete, an axe through a head vertically, decapitations and barbed crossbow bolts - this is all lovely looking stuff. I really appreciated how fluid this all was with victims getting killed right on screen but in a way that I found hard to decipher what sort of effects were used. It happens so quickly that I assumed CGI, yet if it was it is of a very high standard. I loved the kills here, so many of them burst out of nowhere that on more than one occasion I was greatly surprised. I also found the actors all to be great in their roles. Of the fitters themselves it is really the characters Colin (Darren Sean Enright - Cockneys vs Zombies) and Dean (Richard Lee O'Donnell - Zombie Hood, and who also wrote this) who are the leads. I loved the interactions they had with each other, how their lines are so stupid but they work. Humour comes both physically and from the lines characters say. After the cannibals have been discovered and the mother of them (played by Jenny Stokes) is chasing the duo they say "What do you want?" to which she replies "I thought that would be obvious by now" which is then followed by Dean saying "...You still want the carpets fitted?". Funny dialogue like that just fitted the tone here so well. On the physical side of the comedy the best character was Malcolm (Dominic Holmes) whose skinny statue made for some visually funny moments such as a fist fight he attempts with one of the cannibals. Of them they all certainly look the part with some great makeup to give them deformities. What they lack in dialogue (aside from the mother they are all mute) they make up for the evil looks they constantly sport on their faces. On the face of it there is little here that hasn't been seen before in countless other horrors, but for me it was the quality which made this such a great movie. Out of the whole film the only real issue I had was the ending, while good it did feel a little bit rushed for my liking. This was a great horror though, a great script, great looking kills, a great cast and just a blast to watch. Cannibals and Carpet Fitters is due for release by High Fliers Films.